WILD GARDENING AND WHY NATURE ALWAYS WINS | "Global Possibilities"
Margie Ruddick, like most landscape architects, is a master juggler. 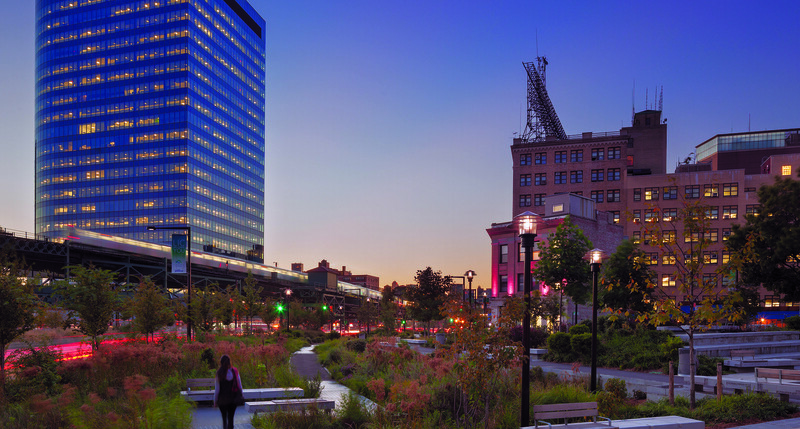 Her seminal project, Queens Plaza, transformed one of the harshest corners in New York City into an urban oasis. But that work required harassing the efforts of several competing city agencies; listening to an active community with a real stake in the outcome; and mitigating in some way a huge piece of infrastructure, the elevated subway. The 2013 winner of the Cooper-Hewitt National Design Award for landscape architecture has a new book just out, Wild By Design: Strategies For Transforming Life-Enhancing Landscapes (Island Press). Last week I interviewed Ruddick, via email, about the book, the role of landscape architecture in the era of climate change, and how she includes the public in her work. MCP: Talk about the title for the book, Wild by Design. How do you arrive on it? MR: The original title was “What Are We Doing Here, Anyway?” The book started as an attempt to answer LEED—a well meaning but prescriptive program. LEED prevented a lot of harm, but it also often prevented innovative design. For instance, because you weren’t using many materials, you got fewer points, so people ended up specifying sustainably harvested wood to a project just to get the points, and I thought: what are we doing here, anyway? It was my own personal checklist. Then I received a court summons for growing weeds in my front yard. Anne Raver wrote about it for The New York Times and the response was enormous. I got emails from people around the world saying, “Thank God, someone finally understands my theory of gardening!” The article was reposted on many “wild gardening” blogs. I discovered that I had tapped into a huge wild gardening world that I hadn’t known about, and suddenly I got it: people were responding to a designer who is clearly a designer but whose work is also a little wild. Thus the title. MCP: The book, mercifully, isn’t a straight monograph. It takes a number of larger ideas and then uses projects to illustrate those ideas. MR: I never wanted to do a monograph. I like that the book inspires lay people, and helps professionals understand just what it is that we are doing here, anyway? I hope it demystifies the process and shows people that there is no one thing called “design.” When I was in graduate school, a frustrated classmate complained to a teacher that he was not teaching us “how to design.” This seemed weird to me. I didn’t like teachers who taught us “to design.” I called it the “A little to the left” school of teaching, where you were being taught a formal style that happened to be in fashion at the moment. I liked teachers who just helped us map out a process. Maybe this came from my mother, who was trained at Black Mountain College by Josef Albers. They spent the first several months doing nothing but folding white paper. I learned a lot from her about having a question you want to investigate, making up a set of rules for yourself, then following your rules and finding yourself at the end of the process in a place you never would have imagined. When I was writing the book, it started to feel unwieldy to me, a little rambling, hard to follow as a long list of “what are we doing” gerunds. Plus I started to see the potential for the book as a course book, and I knew I had to find some way in for people, so I asked myself what the most important aspect of every project I have ever done was, and that is how I came up with the ideas. MCP: It’s interesting that in your list of rubrics, “Expression,” occurs last. That’s interesting to me, because it symbolizes the shift from pure formalism that’s occurred in landscape design in recent years. We know someone like Lawrence Halprin or Peter Walker wouldn’t have placed “expression” last. Was that placement deliberate, or accidental? MR: Haha! Peter Walker once said to me in a desk critique, “Margie, you have to bring down your level of thinking.” He was right. I was trying to do too many things at once, but at the time I didn’t get that, so I thought, “OK, Pete, I am going to do just one thing on this project,” so I did a paving plan, that was it, almost as a f.u. But something amazing happened. I disappeared into the graphic world of digitizing by hand (this was before Illustrator) a massive paving design for a dormitory courtyard. I got to spend a couple weeks just doing that most pleasurable thing: making something beautiful. I learned a lot from my little f.u. moment, that maybe more importantly than all the things I am trying to do—in that case, it was make circulation better, the place cooler, provide pay phones for students (some year BCP, or Before Cell Phones)—I love making things. I love expressing some idea about a place in a way that is more associative than pragmatic. The reason I placed Expression last is because it is paramount on every project. I wanted to end the book with people thinking about the art of what we do, and be inspired to follow their own set of rules on their own path. MCP: We’re now in an era of climate change, where many of the huge challenges will be centered around landscapes, ecologies, hydrologies. What role does landscape architecture have here? How does it work so it isn’t supplanted by other disciplines? MR: Landscape architects have sometimes been tapped to lead critical projects that deal with sea level rise, but more often than not these projects are led by engineers. I don’t mind this. The fact that there are so many projects now the world over that are changing planning and design practices to help minimize the impact of building on flooding, for example, or to just stop building in certain areas, is great, and I think landscape architects do ultimately get a chance to do what we do, which is make the responses more integrated. That’s what we do better than other practices—entertain many different agendas at once in a way that feels composed. This is why I was kind of irritated by Pete Walker—we do have many agendas, and our skill is in weaving them into something that feels of a piece and can be beautiful. I am glad when engineers or architects copy landscape architects. All hands on deck, is what I think. The profile of landscape architecture is being raised, in the culture. It used to be that people would say to me, “What landscape is there for you to be working on in the city?” That has, thankfully, changed. But whether or not the public understands what we do, we will never be supplanted. MCP: Any time I fly into a coastal city—New York or Boston or New Orleans—I have this nagging feeling. I think about all the talk of “resiliency” planning, which I approve of. But looking at how much manmade stuff we have on our unprotected coastlines, and realizing that nearly all of the sea level projections have been too conservative, I think: How realistic is resiliency planning? Do we have to be more honest with ourselves? What do you, as an expert in landscapes, think? MR: All the right questions! Nature always wins. For a long time I was kind of heartsick about the species that are in decline—hemlocks, now maples, almost every native Northeastern hardwood seems to have some blight or problem. Then I just kind of got over it, thinking that the historic declines, like the American Chestnut blight in the early 20th Century, were just fewer and farther between. We need to get used to saying goodbye. I was at a conference on sea level rise maybe ten years ago, and a line from an Elizabeth Bishop poem came to mind: “The art of losing isn’t hard to master, even if it looks like … disaster.” Resiliency planning is essential—changing practices to work with what we once considered disasters, understanding that they are now normal, will save lives and communities. These may just be much farther inland than we anticipated. MCP: Along similar lines, might the new model for public parks be one where the park mitigates the rising water levels? MR: I attended a small symposium at Harvard a couple years ago that was geared toward integrating sustainable storm-water drainage and park design. One thing that occurred to me looking around the room was that we were all from so many different fields and agencies, and there was no one bossy person who would tell us all what to do, the way the chair of a City Planning Commission, or Economic Development boss can. I think if a model like that is to work cities need to create a new job, like the Drug Czar, the Water Czar, who can make all the agencies play together to reach a common goal. MCP: How do you talk to the public in your projects? What role do they play? As a landscape architect, do you face the same kind of public process as planners and architects? If it’s different, how is it different? MR: Public engagement and process are woven into so many of the stories. So many of them are specifically about working with communities as collaborators on projects. But public engagement and public process—if the latter means a formalized process to get a project done and approved—are different things. The public process is one thing. And it’s the same for landscape architects: you just have to show up and follow the rules and be clear and illustrate everything, and then integrate the ideas and feedback from meetings. But the issue of public engagement is another. The processes in engagement are often slow, incremental, almost unnoticeable bridge-building, so that the community affected by any project gradually acquires a sense of ownership, stewardship, a proprietary interest in the project.